Vocal teacher Sandi Hammond directs members of the Butterfly Music Transgender Chorus during a rehearsal at a church in Cambridge, Mass., Oct. 7, 2015. The chorus was founded by Hammond. 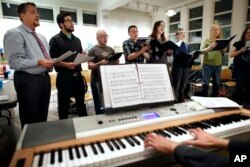 Founded last year in Boston, it's one of the country's first choirs reserved for transgender singers. It was created for those who didn't feel welcome at traditional choruses, but it's also one of few places where transgender vocalists can learn how to adjust their voices safely while they're in transition. Members of the Butterfly Music Transgender Chorus rehearse at a church in Cambridge, Mass., Oct. 7, 2015. The chorus is led by Sandi Hammond, a vocal coach who also trains members how to adjust their voices safely when they transition. In recent months, the chorus has performed at private concerts around Boston while it prepares for its first public show next spring. Despite a discreet start, it has struck a loud chord. As new transgender choirs form across the United States, some have credited Butterfly Music as their inspiration. Through the choir, its members are fighting an often overlooked problem in the transgender community. When they transition, many speak and sing in a higher register to sound more feminine, or deeper to sound masculine. Both can damage the vocal cords. But living with a voice that doesn't match their appearance can trigger deep depression. Kit Johnson sang as a soprano in college vocal groups, but the testosterone treatments that deepened his voice during his transition also robbed him of vocal control. Johnson remembers hearing notes in his head but growing frustrated when different ones came out. Butterfly Music is believed to be the second transgender choir in the country, following the Transcendence Gospel Choir, which formed in San Francisco more than a decade ago. Others have recently started in Chicago, Los Angeles and Atlanta, where a group called Spectrum said it was inspired by the Boston group. Butterfly plans to unveil its sound at a public debut on April 9 at First Church Boston, a Unitarian congregation. Since it raised $12,000 online to launch, the chorus has grown to more than 20 members. It's now raising money to expand again.